How to make money from home online? There are thousands of different money making products or ideas on the internet. The big difficulty is choosing the legitimate programs amongst all the hundreds of scams. You may find something genuine but then discover the pay per hour is only cents. In this post, I will mention some of the legitimate jobs that I have found and the very few I would recommend. In addition, I will show you the different steps to set up your own internet business, as I think this is the best choice to make money online. This post may contain affiliate links, which means, at no additional cost to you, I may earn a commission if you click a link and purchase something that we have recommended. For more information visit my disclosure page. Most paid to click/survey/shopping/etc sites can be considered as legitimate and include sites such as Swagbucks, Quick Rewards Network or ClixSense. The big problem with these sites is the amount you are paid relative to the time you spend completing the tasks. Your hourly rate will probably only be a few dollars per hour, at most, and that’s the reason I don’t really recommend this type of site. However many people love these sites! You can get paid for things that you may do anyway like searching the web, watching videos, downloading apps to your phone or shopping online. Then there are additional ways to earn by completing surveys, referring new members, completing daily goals set by the website, entering a sweepstake or playing online games. If you want to get paid for carrying out these tasks, then try one of the platforms I mentioned above. The best known is Swagbucks and that is where I would start. The online survey sites are mainly legit, although you must watch out for any that require a payment to join. There are others that may not pay out as much or as regularly as you would expect, so always do your due diligence before signing up. Again I don’t recommend online surveys because the hourly rate of pay is usually so small, I consider it a waste of time. Some survey sites I’ve reviewed: Take Surveys For Cash, Paid Surveys at Home, or Only Cash Surveys aren’t the best and I certainly would recommend them. If you are interested in earning money from surveys you could try Opinion Outpost, Pinecone Research, iPoll or Global Test Market. These are just a few of the legitimate sites that pay in cash via PayPal but there are many, many more. If you’re serious about making money from surveys sign up with a few sites so you always have a few survey opportunities. This is a pastime (I won’t call it a job) that you may find on some reward sites and on ad clicking sites. Again very poor rewards for the time you spend watching ads. There are many scam sites that operate like this and a few honest sites, so as always proceed with caution. One thing to remember you will only earn a few cents per click at most. There are websites, like Two Dollar Click.com, that promise $2 for each ad you click, yet they charge their advertisers just a few cents for each ad display. Clearly, this isn’t sustainable and surprise, surprise they never pay out. So don’t believe any website that proclaims you can earn good money per click. Paid Verts is another paid to click site but with some very complicated earning options. You are encouraged to invest to earn more. Not something I’d recommend doing! As always you need to carry out thorough research on any platform you intend joining. You will find the rates of pay to be very little per hour. I don’t recommend this as a way of earning money from home. Micro jobs are small, one-time jobs, which usually pay a small fee. However, with a little work, when you have successfully completed some tasks you can improve your reputation to earn more. Several companies offer micro jobs, some of the better known are Amazon Mechanical Turk, the Smart Crowd, CrowdFlower or Clickworker. Although these sites are completely legitimate, when starting the amount you are paid for the tasks can be too little to earn much. But after time as you build your reputation, it is possible to earn some decent money. You may have to complete an assessment before being accepted into some programs. Fiverr and SEO Clerks are similar, you advertise the service you offer. It could be designing logos, creating Pinterest pins, writing or creating a short video… the variety is vast. You then state how much you want for your gig and wait for customers. If you have a skill you can offer I would recommend trying Fiverr or SEO Clerks before the micro job sites. 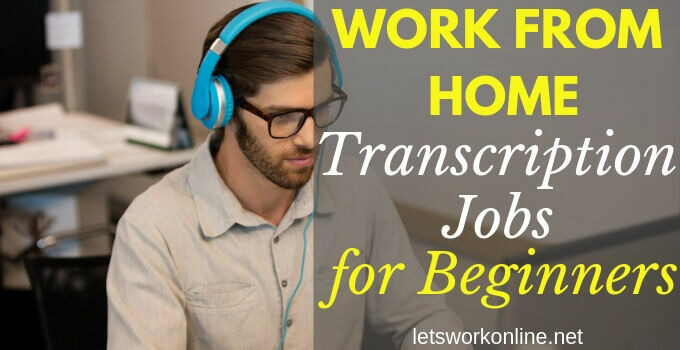 Transcription is the process of converting speech or audio into a text document. Captioning divides the text into blocks or caption frames that are time-coded to synchronize with the audio of a video. You will probably have to take a grammar/writing test and carry out a trial transcription to see if you’re cut out for the work. 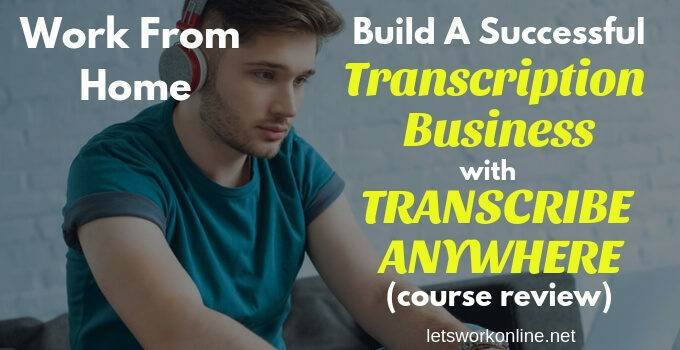 Some companies that offer transcription/captioning work are: Rev.com, scribie.com, gotranscript.com or transcribeme.com. How much you earn will depend on your speed, accuracy, and number of jobs available. Rev.com say their top earners earn $1500 per month but the average transcriptionist earns about $150 per month. Mystery shoppers give unbiased feedback on perhaps a shopping experience, the service in a restaurant or the customer service when they returned an object. Many types of business can use mystery shoppers. They need to have direct contact with their customers. The information received from the mystery shoppers will be used by the company to improve its service. The companies that hire mystery shoppers are third-party companies. Some of the better known are – BestMark, Market Force, A Closer Look or Intelli Shop. As so often online there are also some less honest companies that are out to scam you – beware! Again difficult to know how much you will earn. You may get paid between $5 -$20 for each assignment, more experience will normally lead to higher pay. Better to consider this as an extra or supplemental income. To get a good supply of jobs you will probably need to sign up with several companies and you will need to live in or very near to a big town or city. This is testing websites or apps to check their functionality or usability. The feedback you give will help the website owners identify problems with their websites or apps. You may be given a set of tasks, like buying a certain product from an e-commerce site or booking a ticket for a ferry from a ferry company. When you carry out the test your screen and voice are recorded. It’s a good idea to speak out loud – describing the different actions you are taking and why. Most tests take 10 – 15 minutes and the pay is about $10 per test. The pay is reasonable but the problem is the number of tests on offer. Most members of user testing platforms say they don’t get enough jobs. So this should be considered as a side hustle to earn some extra cash each month. 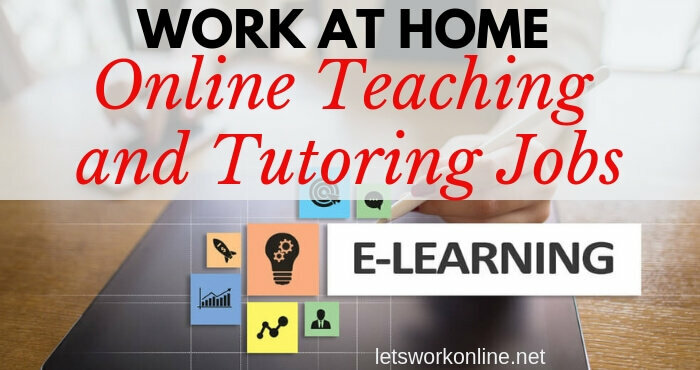 Yes, it is possible to earn money tutoring from your own home! There are a number of websites that offer tutoring jobs and you can earn anything from $50 to $5000 per month (this is according to one of the tutoring websites) or hourly the rates are from $10 to $40. Some of these sites require you have some sort of qualification or experience, while others require that you take an assessment test. If you have the skill to convey your knowledge to others this could be for you! To get started you need a computer, internet connection, a headset with a microphone, a webcam and Skype software so you can communicate with your students. There are quite a few websites that offer tutoring jobs: tutor.com, tutorgroup.com, gofluent.com, tutorvista.com, chegg.com or t.vipkid.com.cn. or t.vipkid.com.cn. These are a few of the possible platforms they all have their own requirements and different levels of pay so check them and others out at your leisure. Another way many people make money online is by writing an ebook and then selling copies. Writing an ebook can be rapid, easy and cheap to produce. If you pick a good subject and get your marketing right it can also be very profitable. What makes a good subject? You could solve a problem with a “How To” or a “Step by Step Guide”, this also has the advantage of positioning you as an expert in your field or try and come up with a solution for a common fear. Do a search on Google and you will find websites that list ebook ideas. You will also find blogs that go through the writing process if you feel you need some help. If you enjoy writing, creating websites, graphic design or search engine optimization you could earn a good living by offering these and many other services. There are many websites or business owners who don’t have the time or necessary skills to carry out all the tasks they need. You could do this part-time or full-time. This is one of the quickest ways to create an online income but you have to put in the effort to be successful. To get started you could reach out to people/businesses you know or you can apply for work on Upwork. Once you have those first clients you can start building your reputation, serve your existing clients well, build your portfolio and slowly increase your prices. I recently found a writer after he left a comment on my website. He didn’t say he was a writer but I visited his blog, was impressed by his work and saw that he did freelancing. This shows how important it is to have a website! Starting an online store has many advantages over a traditional shop. The most important being the cost, no rent or wages to pay. You can either sell your own products, set up an affiliate store or a drop shipping store. Any of the 3 could be good, although my choice would be one of the last two. With these, you don’t need to deal with stock, shipping, different tax rates, etc. To create an e-commerce store you could either install the WooCommerce plugin on a WordPress website or use a hosted solution. Some of the better-known platforms are Shopify, Magneto or BigCommerce. If you are interested in setting up an online store you can find guides on Shopify or Oberlo has a great dropshipping guide. As with blogging, where setting up your blog isn’t the hard part, it’s the same when you create an e-commerce store. Setting up the store is relatively easy but the challenge is getting traffic. 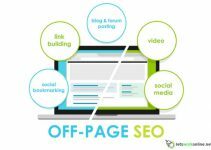 This post will give you some SEO tips that will help you get rankings and then traffic. This could be a very good way of earning money from home, you’ll need to put in the work but I recommend creating an online store. The concept of affiliate marketing is quite simple. You promote a product on your website, someone clicks on your affiliate link, you are paid a commission when someone completes a purchase. These last two methods of making money from home are my recommendations with the #1 position going to affiliate marketing. The possible rewards from an online store or affiliate marketing are much greater than from the other ways of making money, however, don’t overlook the fact that you will have to work hard and probably for a few months before you earn your first dollars. You want to start your very own online business, but don’t know where to start? With today’s technology, excellent training platforms, great online tools, and small start-up costs, now is a wonderful time to start. Building an online business around something you enjoy is feasible. You need to have the determination, patience, and knowledge. A lot of people I know think it’s possible to earn money online (and they’re right), while others are skeptical. However, to know the truth you must take action, get started and then keep going. The truth is you can make money by building a legitimate site, that helps people by giving them the information they require. To be successful you have to provide a solution to a problem people have. If you’re reviewing products your reviews should be genuine and helpful. If not people will sense you are just trying to make money. Sounds good! Just be aware you have to put in a lot of work and it will probably be a few months before you earn your first dollar. Still interested, let’s have a look at the different steps. Your first task is to pick your niche. Instead of writing about any subject you should build your site around a specific topic. Your niche should not be too broad if it is you will struggle to be seen amongst all the other blogs in your niche. For more on picking your niche subject click on the image below and you will receive some great ideas from Kyle of Wealthy Affiliate. It’s a good idea to choose a niche based on a passion, hobby, interest or an expertise you have in a particular field. This is important because you will be writing content regularly and for an indefinite period. Make sure you have enough material to keep producing posts for a long period. For more information on choosing your niche see this post. Something else to bear in mind is the need to find products to promote to your readers. Without having products for your niche website, you will not make any money. Now you have your niche, you should turn your attention to choosing a domain name. You should try to keep to these few general rules. Your domain name should be short, memorable, easy to spell and pronounce. For more pointers to choosing your domain name see this post. The next thing you need is hosting. Choosing a good web host can mean the difference between your site taking a long time to load and being difficult to update, or loading very fast and keeping your visitors on your site. People expect a site to load rapidly if it doesn’t they will click away and you’ll lose potential clients. It’s possible to get decent hosting from $4 – $10 per month. Which hosting plan do you need? Click here for more information. Getting started some reasonably priced shared hosting is all you need. In days gone by, there was no choice you had to use an HTML editor. The sites often looked a little basic and you had to know something about CSS and HTML coding. Another disadvantage was the time it took to get your site ready to go online. I remember my first websites, it took me several days to create a few pages. Now I could complete the same operation in a few hours or less, using the present-day technology. Both these options make building a site very easy, rapid and as an extra bonus, you don’t need to know any HTML or any other coding. Although the drag and drop editors will provide you with a decent site, I prefer the WordPress platform. It’s easy to use, there is a wide selection of good looking themes and more functionality than with the drag and drop site editors. Once your site is created you need to start adding unique content. Remember, your content will distinguish you from all the other sites out there, so it’s very important. When writing you should always remember the intention of your website. It doesn’t really matter what you’re selling, you have to consider what your audience wants to accomplish. What are their goals? How can you help them reach their objectives? Starting from this angle you will be able to write content and promote products that will be useful to your audience. In addition, you should also think about the action you want your visitors to take. If your site is an affiliate marketing site, you will want people to buy your products. So you will need to include a call to action. When you visit a site on the internet, have you noticed how you take in the information? Often, you will probably scan the page quickly to get a general idea of its content. Then if you think it might be an article with some information you are interested in, perhaps you will read it in more detail. Therefore, it is a good idea to create short paragraphs, with headings and lists. Articles created in this format will be easy to scan for your readers. These are just a few suggestions on writing content, for a more detailed post see this article. Over time your blog and the quality content you write will attract loyal readers. These readers will grow to trust and respect your opinion. Consequently, you can promote different products related to your articles without jeopardizing the sincerity of your blog. In affiliate marketing, to monetize your site you will direct your visitors to different products or services and you will receive a commission when a sale (or sometimes an action) is made. Therefore, you need to find appropriate affiliate products. Ideally, these will be reliable, quality products. Promoting low-quality products could harm your brand name and the relationship with your readers. When you have found a product, you need to be accepted by the affiliate program or the affiliate network. This is usually quite rapid and once accepted you will get your unique affiliate link. There is also usually some promotional materials (banners, etc) that you can use on your site if you wish. Now you need to include some affiliate links in your content or insert some banners in your sidebar. As you can see it is possible to create your own affiliate marketing business, very cheaply. Although it’s a fair amount of work, the results can be very rewarding. Some important points that you should consider. Getting some good training can put you on the road to success. 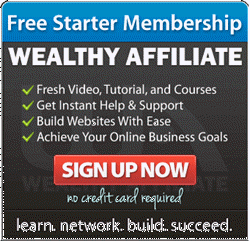 The platform where I learned about building an internet business is Wealthy Affiliate. The training is step by step and very easy to follow, even for a complete beginner. You are taken from choosing your niche to monetizing your site. The program provides excellent support, there is always someone on hand to answer your questions. You can try the program for free and take a look around. If you are impressed, there is a paid option and this includes all the tools you will need on your online journey. I am sure I wouldn’t be earning money from my website if I hadn’t found this program! As I previously said, before your site starts to earn money, will take some time. So keep your present job for the moment. I see many people who give up after just a few months. They have taken the time to build their site and write content, nevertheless, they are disappointed not to earn any money in these first few months. Don’t be like them. When you start, be determined to continue until you make some money. It will happen, it’s just a question of time, so be patient. I hope my article has given you some ideas on how to make money at home online. 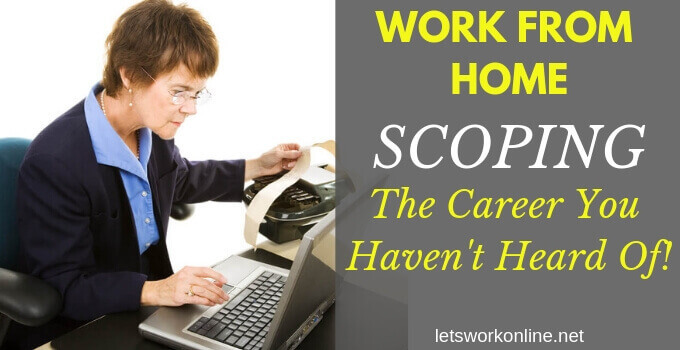 If you want to earn some good money there is one common point in all these methods – you have to put in the time and effort. Never believe any program that promises you large earnings for little work. It may sound very tempting but this doesn’t exist! Online or offline, to build something successful takes time and hard work. However, the big advantage online is you don’t have to invest much in the way of dollars, the biggest investment is your time. I wish you every success either in earning some extra money or in building your online business. If you have any questions, comments or experience with any of the money making methods mentioned above or in building an online business I would love to hear from you. 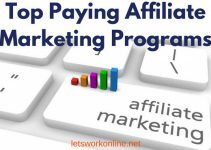 What are the Top Paying Affiliate Programs? Nice informative post. These ways are still relevant but methods like surveys are going on the decline severely. Agreed, surveys are largely a waste of time, much better to spend your time building your own business. Hi there Peter, interesting suggestions on some ways you can make money at home from the web. Some ways I haven’t thought of…. some ways I have personally tried but that didn’t really work for me like online surveys. But what about clicking ads? It almost looks like surveys. You consider it more of a past than a job. But does it really gives you at least a few pennies doing it? I have also tried selling on eBay. But I didn’t make any profit from it. Now I’m considering trying affiliate marketing, because it looks like less a hassle than trying to dropship goods on site like eBay and having to deal with customers directly. What do you think? Where should I start? Clicking ads can pay you a few cents, in a way it’s a little like taking surveys because you earn so little for all your time. Certainly not something I recommend. Dropshipping can be good but my preference is for affiliate marketing. When you start affiliate marketing you must be prepared to put in the work and be very determined, because you won’t start earning right away. The best way to start is to find a good training platform that takes you through the process step by step. I am a member of an awesome educational platform that teaches you everything about setting up your own business. This platform is called Wealthy Affiliate, it’s free to join and it’s definitely worthwhile checking out. Hope that helps you out. There are several legitimate ways to earn money online but the majority pay so badly they are not worth considering. 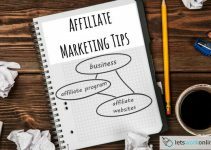 Which leaves us with just a couple of ways that I would recommend either building an online store or affiliate marketing. As you say, whichever you choose, getting a good education is necessary if you want to be successful. Even if you decide to build an online store with an online store builder like Shopify it’s still a good idea to take a training course that will show you how to write your own original content, do keyword research and SEO. Once you have tried the training at Wealthy Affiliate you probably won’t look elsewhere. Great article. It is really good to land in a website that focus on legitimate ways to earn money online. I have been following your articles and I really enjoy them. Thanks for offering excellent and trustful information. My first dollar online was actually doing online surveys. I was really happy to be able to earn that money while being in the comfort of my home. The good sensation vanished when I realized the time I had wasted to earn $15 in a whole month. I was spending more than 1 hour 5 days a week just for $15. That was insane! Then I discovered the great opportunity of internet marketing. I am not making any cent yet, but I know my time is invested in a business that has the potential to earn me 1000’s a month. This would give me the kind of freedom I have never imagined, like travelling whenever I want, not having to report to a boss, not depending on a job contract to pay my bill and many other advantages. I truly believe that an online business based on the affiliate marketing model is the most efficient way to make money online for the long term. Thanks for your kind words. There are several legit ways of earning money online, but many of these methods take a lot of time for a very small reward, just like online surveys. An added disadvantage is that they are not very interesting or enjoyable. Finding something that works can be hard when you’re trying to make money online. However, if you can find something that works and that you enjoy this can be even better. With internet or affiliate marketing this is possible because you can build a business around one of your passions or hobbies. Success with affiliate marketing won’t come overnight, it’s a result of hard work. Another great thing about affiliate marketing is that even beginners can do it, and if you never give up you will build a profitable business. Thanks again and good luck with your business Stefan. Peter you have a clean well laid out website. You tell them that there are some online jobs that are called legit, but are not worth the time to do them. I think you have the right idea about this, if it is not worth their time let them know it. And get them started in the right direction. Click bank sounds like a real winner. You have the right idea sending them to Wealthy Affiliate. There are many ways to earn money online that are legit, but often you are paid so little it’s just not worth the effort. These jobs are often promoted with the exaggerated promises of decent earnings, which will leave most people disappointed. I think people like the idea of earning from the time they start. A better idea is to accept when building a sustainable business you may have to work for a few months without earning anything. If you accept that and are ready to work hard, Wealthy Affiliate is a really great place to learn. If you follow the training, you will become one of the many successes that have benefitted from this program. Great post btw. I have wanted to make money at home from the internet for years before I discovered your last two methods, affiliate marketing, eCommerce. And I also wasted some time with some of the other task orientated tasks you mention. In general, I found my time being wasted with things like surveys, pay to click sites. But I have been able to build a real online business that makes good money from home using affiliate marketing and building a website based on a niche that I am passionate about. After all this time, I think the best advice I could give someone is to create an online business based on something you love, not based on what you think is the hottest niche or product. If you love flying kites, than make that your niche and you might be surprised at how well you can do at finding an online niche audience who loves the same thing that you do. Thanks Peter, always great to read your posts. I completely agree Todd, the task orientated or reward sites are a waste of time, you have to work for a long time to earn just a few dollars. When you are looking to earn money from home, you must forget all the get rich quick schemes, they always promise a lot but never deliver. Building any business takes time and hard work, this shouldn’t be forgotten. Like you, affiliate marketing or eCommerce, are the methods I prefer and you give some great advice in suggesting building a business around something that you like or are interested in. This is important because you will be writing about your subject or niche for a while, this is easier and more enjoyable if it’s something you have an interest in. So, glad you are doing well with your affiliate marketing site. Great article Peter. There are really plenty of ways to make money online and anyone can choose any way they like. The main thing to understand is that to be successful online you need to focus on your choice and work hard in that direction. The best way is of course create a website, choose a product or a service and create content. Content is in fact the core of any business online and if you can’t create content and offer your readers some value then internet business is likely shouldn’t be your choice. Creating content becomes easy when you know how to do it and Wealthy Affiliate can teach this. BTW, did you learn how to create content from Wealthy Affiliate or you already had some experience before that? Yes, there are quite a few ways of earning money online. Although I don’t advocate many of the legit methods I mentioned in the article. With many of these the time you spend doing the tasks will give you a pay of just a few dollars per hour at most. So for me these sites aren’t worth the time. That’s why my choice to earn money from home is affiliate marketing and as you say for that you need a website and content. It’s true content is really important, it’s this that will cause people to take action. Creating content may become easier with experience, although it still takes time and effort. I learned to create content at Wealthy Affiliate, which is an incredible training platform. I agree with you on the number of ways there are to make money online because there are far too many, but unfortunately a lot of them are scams! I’ve come across Swagbucks before and heard from a few members that their accounts got shut down when performing the tasks and trying to claim their gift cards. Do you think this is true? I can also see why you rate Affiliate Marketing as one of the best ways to earn a living online because there must be so much potential! Wealthy Affiliate sounds Amazing, and especially when the training platform has helped you to build a successful online business. I will definitely give this one a go. You’re right Neil, there are many ways to make money online, amongst which there are many scams. 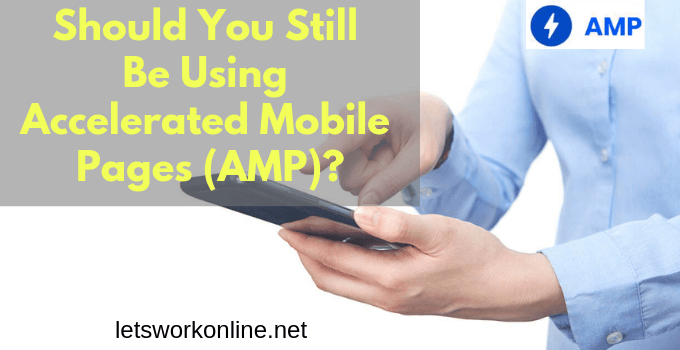 With many of the money making programs, that I listed, such as completing surveys or clicking ads the hourly rate of pay is so little I don’t think it’s a good idea to get involved. Swagbucks seems like a legitimate site and has a very good reputation. I have heard about a few people having their accounts shut down or Amazon gift cards not working, however, I don’t think Swagbucks is a good money-making opportunity. Because once again, you will be working for so little per hour, I certainly don’t recommend it. With affiliate marketing you have a much greater chance of earning some decent money, it may take time and hard work but it is possible. To achieve my success, I followed the step by step training at Wealthy Affiliate. This is really a great training platform and I have no hesitation in recommending it to you. Wow, Peter. This article is really comprehensive and has some great points to it. Glad to see someone is taking the time to help people looking for legitimate ways to earn a few extra bucks. There’s so much bad fruit out there that it can be confusing if you don’t know what to look for. I’m a big fan of WA as well and have been a premium member there for about a year now and how grateful I am for that! My site mostly focuses on affiliate marketing and after a year of effort, it’s really starting to pay off. Anyways thanks for the info and keep up the good work! For a newcomer to the world of making money online, it certainly is pretty difficult sorting out the good from the scams. Wealthy Affiliate is really an outstanding program and it’s certainly worth checking out if you’re new to internet marketing. There you will be taught the correct way to build an online business. So glad to hear your affiliate marketing business is starting to make money, just goes to show what they teach at Wealthy Affiliate really does work. Hi, thanks for these awesome suggestions – I can’t wait to try them out! I’ve been using Clixsense for a few years now and I’m so glad you covered a few alternatives! Swagbucks looks a really cool site – have you used it yourself and what is the pay rate like? I am not really a fan of these sites. Clixsense or SwagBucks are both legitimate, but the rate of pay per hour is very small. They are okay for passing a few minutes per day, apart from that I don’t recommend them. My suggestion is to build your own online business and to do that it is a good idea to get some good training. The rewards from an online business can be much greating than the few dollars per hour you will earn from the “get paid to” or online survey sites. I must say what a “beautiful” post, very clean and well laid out, it was a pleasure to read. The content is awesome and you give your readers very good information on ways to make money online and even tell of your own personal experience which makes it all real. It is indeed refreshing to find a post that give quality information and not pushing some get quick rich scam or one click software the will make you rich. You tell your readers the truth when you say before your site earns money, it will take some time. Yes that is right and too often people think the internet will magically turn them into overnight millionaires, which simply is not true. Thanks for your kind comments Peter. I always prefer to tell people the truth, even if it’s not really what they would like to hear. There are no short cuts to making money, it requires hard work and takes time. However, for anyone who is ready to put in the work Wealthy Affiliate is a training platform where you can learn at your own pace. One of the aspects I particularly appreciate is that they don’t promise you that you are going to make money quickly. No, they tell you if you work hard, are persistent and never give up you will succeed. I have found this to be very true. The surveys and first things you mentioned really are a waste of time. Just a thought on clicking on ads for money, maybe they are considered “legitimate” but is it honest? How can sitting clicking on ads so someone sees click through’s be honest? It is the same mindless activity as being paid to like facebook pages! Setting up a proper online business is definitely the way to go. Work for yourself and reap your own rewards. Do something interesting and constructive. My way of looking at all these make money online opportunities is to ask one question: Would you consider this a career? If the answer is NO then it is a waste of your time. If it is yes then go for it. Creating your own business is definitely the best thing you can do, it will take time and is a lot of work. But if you choose the right niche it will be enjoyable. You are totally right about becoming an affiliate when first starting an online business. I’ll admit I have a few talents, but I feel that learning how to create a site and creating a product is too much for a beginner. I’m also glad that websites have become so easy to create; as a kid I used to think it would cost me hundreds of dollars to hire someone to create a website for me. Now, I create websites and it takes me less than a minute until I can start creating content. Creating an affiliate marketing business is a good place to start for anyone who wants to earn money on the internet. It’s true building a website has become quite easy and very rapid with the different online site builders. Although, I only know of one that provides the training to get your sites ranking in the search engines and that’s SiteRubix. Once you have created your website the real work starts, writing quality content that will help your readers. Hello Peter fantastic article on how to make money online. I have even tried to participate in surveys, it was not it was not a gold mine, I spent way too much time on it compared to what I gained. I also tried clicking on various commercials. for example Traffic Exchange I do not really have as much success. I spent way too much time on it. My Affiliate link was more or less Scam. I know there are other ways to make money online. For example, as you write with a shop or drop shipping. But the problem is that you are responsible for customer relations and customer service. If you choose one of the two forms. I myself have started with affiliate marketing. I admit that it has taken time and learn to write and be good at writing. I myself started working with WordPress you also recommend. My question to you and how long it takes? how much work you have to do before you can see and measure its results. Surveys or clicking ads might be legitimate ways to earn a little money online, but the pay is so little, I only think this is good if you have a few minutes to spare from time to time. You should consider these methods as a little fun, just to earn a few dollars per month. Having an online store or drop shipping could be okay, although as you say, you will have the hassle of customer service. So, we come back to the choice of affiliate marketing, where you have the chance to earn a good living and you are not responsible for the customer service. How long it takes before you start earning depends on a number of things, notably the amount of time and effort you can put into building your business. Personally, I was able to put in two or three of hours a day and it took me almost a year before I started earning a regular income. The time before you start earning could also depend on your niche and if it is very competitive or not. I think it’s a better idea to build your site with the idea of providing information that is useful to your visitors and not thinking about earning money to start with. If your content is useful, you will make sales in time. The most important thing is not to give up.